All right world I can say it – I’m a Prepper! So many people give me the reaction that I’m crazy. That I’m actually hoping something horrible will happen so I can break out my canned goods and emergency radio. That people should suffer around me so I can test to see if my batteries are really good for ten years. That is the last thing on my mind. But I watch the news. And it wasn’t always showing far away places and strangers like the tsunami and resulting nuclear meltdown in Japan during 2011. I remember seeing the aftermath of Katrina 2005, of talking to my brother while he weathered Superstorm Sandy 2012. Of my best friend telling me she almost got trapped in her car during Snowapocalypse 2014. So awful things seem to always happen to strangers….until suddenly it doesn’t. You don’t have spend your life savings on things hopefully you’ll never need. Like this family. Though, if you look closely, they don’t look too worried about anything. But just get the most basic of extra supplies that will give you peace of mind. Is that three days or three weeks? That’s something you and your family need to think about and discuss. 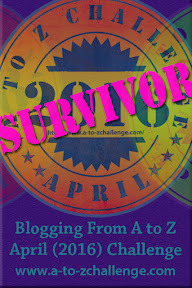 This entry was posted in Blog and tagged #atozchallenge, emergencies, emergency, emergency preparedness, Prepper, prepping, Rachel Wilder, Writer Zen Garden. Bookmark the permalink. I believe the saying that anarchy is only three meals away. Most people probably don’t have more than a few days’ worth of food. Shame on them. Awesome photos, by the way. Be well! I think planning for emergencies means utilizing your common sense. 🙂 I actually took a workshop on that, though never got around to getting some supplies. Which is a shame, because some months after the workshop we had a storm that messed with the electricity and internet infrastructure and we were cut off for a few days…some people didn’t haven electricity for weeks. We got lucky, and we could have used some emergency supplies.